IMMACULATE Turnkey home with Private gated Courtyard, Super low maintenance Artificial turf (no lawn, no water waste) Beautiful hardwood floors, Kitchen Remodel (2014) taken down to the Studs; Single Granite slab, Upgraded Bosch appliances, lots of Solid wood cabinetry, 40 Bottle wine Refrigerator in Granite Island, Separate laundry room, and direct THREE car garage access. Newer Custom doors lead to NEW Alumawood Patio; Ceiling fan, Recessed lighting and Great entertaining space. One of the Four bedrooms currently used as an office; Tall Cabinets, Desk, shelves, floor to ceiling mirror Wardrobes and a Fantastic work space. Master Bedroom, Custom blackout Drapes and Master Bathroom with Soaking tub, separate shower and Walk in closet. Exterior painted 2 years ago, recently Tented, Newer water heater and Upgraded Exterior electrical for DuraMax Generator. Lots of street parking, Home DOES NOT back or side to a busy street, No HOA dues, NO Mello-Roos Tax. 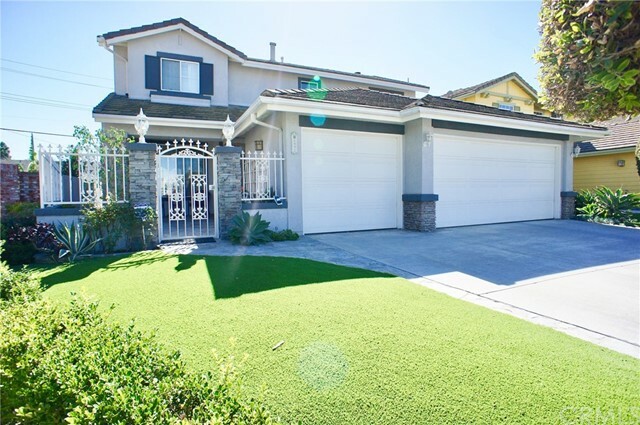 Close to GoldenWest College, Westminster Mall and the 405 Freeway!